When and how did you first become involved in preparations for departure from / closure of various ministries in the Province? It began in 2012 when I was elected Definitor and John Hardin was Provincial. 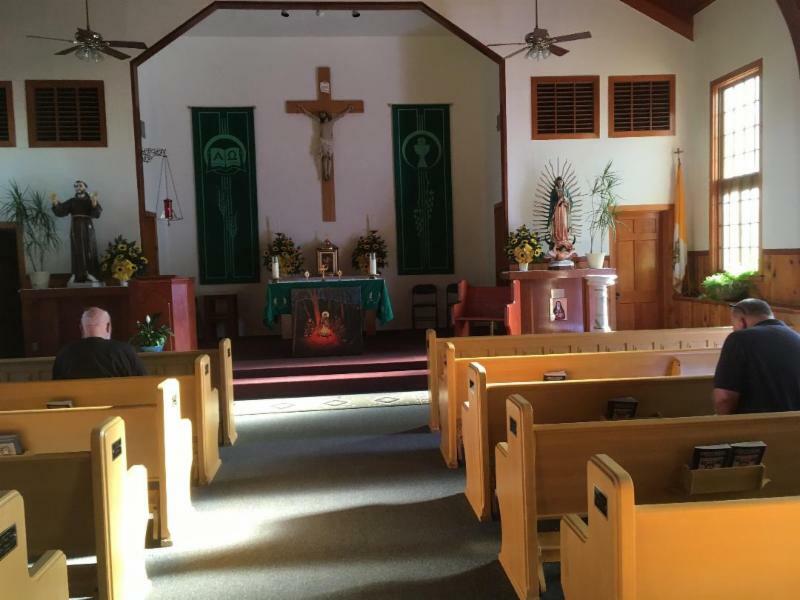 We began the process of returning the two Our Lady of Guadalupe parishes-- one in Delano; the other, in San Jose. I think this was the first time we had a transition plan. We actually went to the parish and worked with the people in transitioning the leadership to the Diocese. We owe this process to John Hardin who, having in mind the People of God, pushed for having a transition time. He asked Robert Rodrigues to help put together an outline and materials for this. We have been using it in all the parishes ever since. By July 1 of this year, we will have returned 11 places since 2012. I have not participated in all of them, but in several of them. Can you list some of the places where you have been involved in the transition process? I have worked with 4 of the 11 places we have returned to dioceses. The other 7 places I have participated in indirectly or not at all. 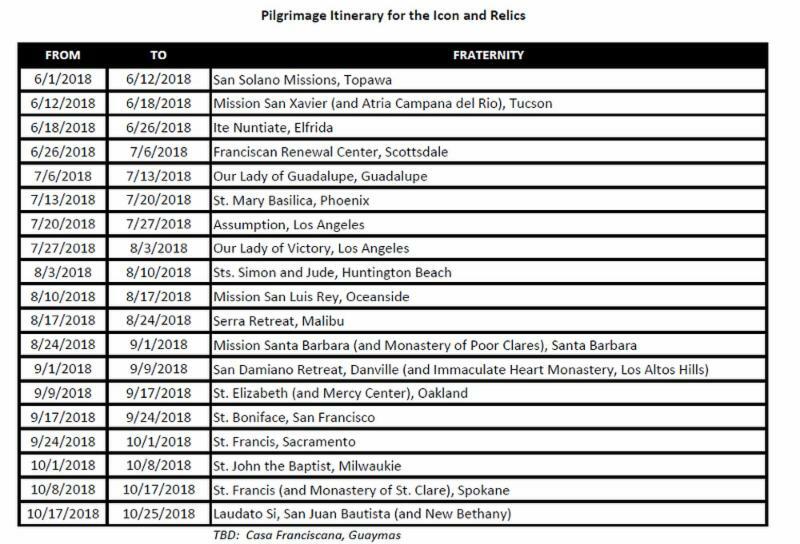 For example, after finishing the transition process in the two Guadalupe (OLG) parishes, I was assigned as Director of our Mission Casa Franciscana in Guaymas, Mexico. 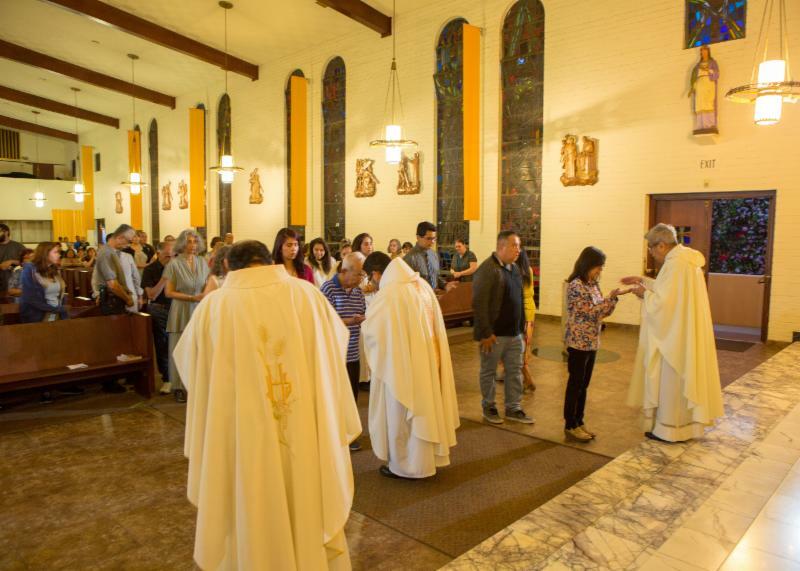 During that time, places such as Mescalero, Tularosa, and Ascension Parish in Portland, Oregon were returned to their respective dioceses. Then, in 2016, when the new administration was elected, we had St. Francis, Sacramento returned. They used the transition process we had developed and it went very well. 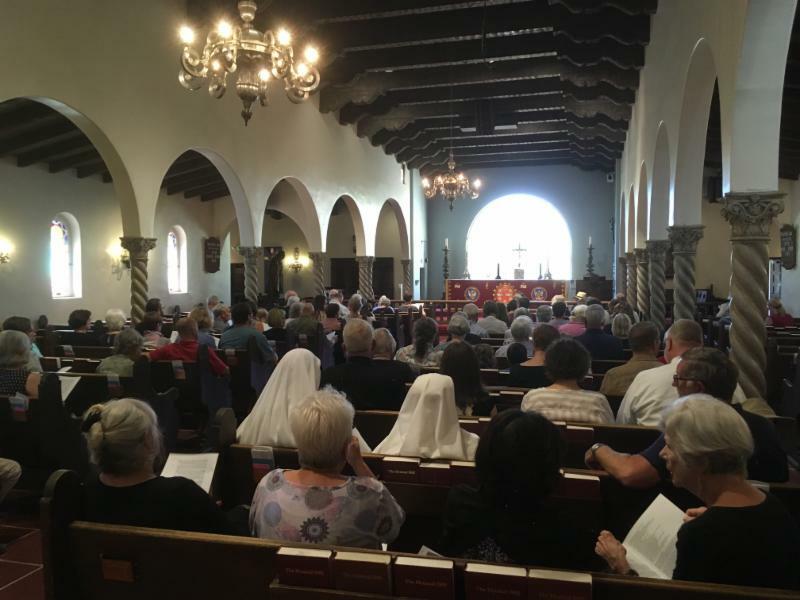 After that, we moved from Immaculate Conception Chapel in San Francisco and at the same time, we were doing the process at Old Mission San Miguel in which I was involved directly carrying on the transition. Although we had only two months and things were a bit rushed, it was a powerful transition. This experience thought us one big lesson: Never do transitions in just two months! One week after finishing the process at San Miguel, in November 2017 I started at St. Francis, LA. At the same time, we withdrew from the Apache reservation at Whiteriver (May 20, 2018). But there we didn’t use the transition process. It’s a different culture; we listened to the pastor ( Eddie Fronske). He told us that he would prepare the people personally and then arrange for the final Mass. Recently, I went to the San Carlos Apache reservation. 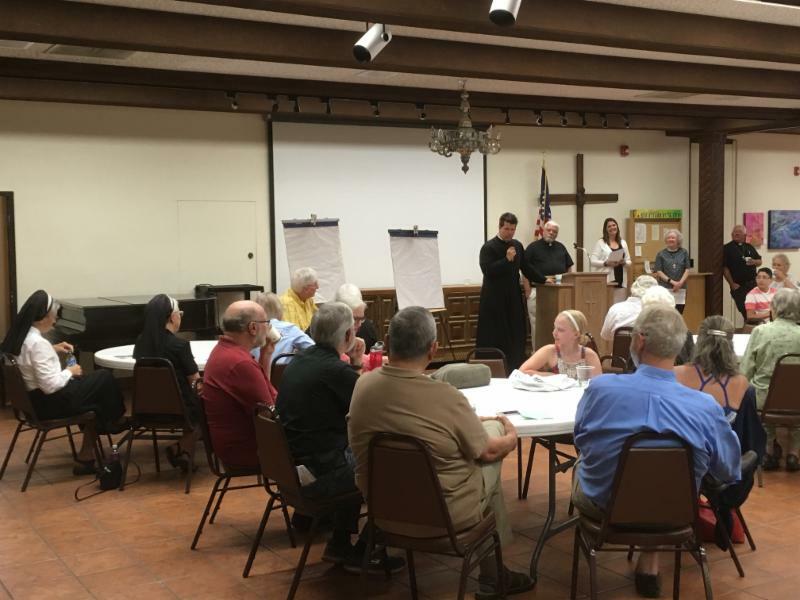 We are returning our ministry there to the Diocese of Tucson as of June 24. It’s the same process, as at Whiteriver—the transition process would not work in Apache culture. Leaving is not a celebration for them or for us. Hopefully, a representative of the diocese will be on hand to receive the ministry. Until now, our relinquishing of all of these places has been driven by the reality that there was just one “last man standing” and we didn’t have another friar to send in his place. We are returning St. Francis because there is no one to send there. As of July 1, we will hopefully be entering into a time that it is going to give us the possibility to breathe a bit, and be proactive instead of reactive in the process of planning and continuing our process to renew and restructure our ministries. Can you describe the process that you use? Has it been effective? 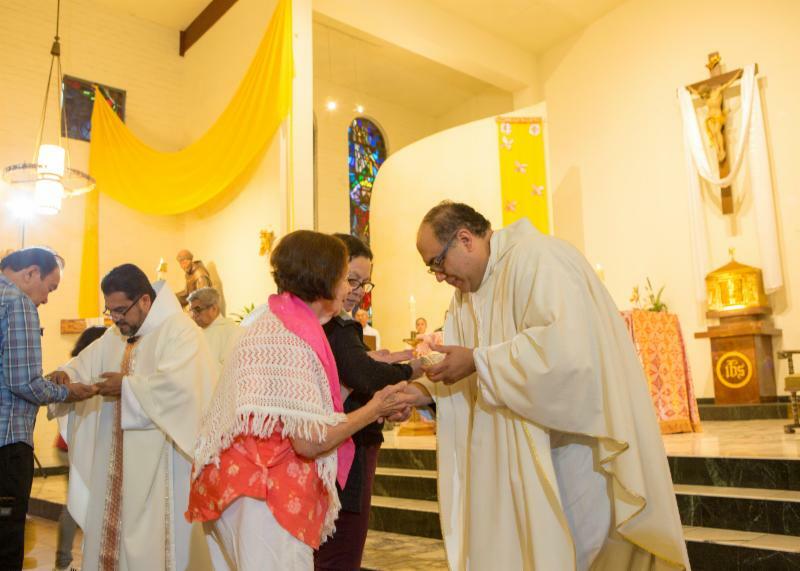 (l to r) Friars Sebastian Sandoval, Martín Ibarra, René Juarez at Healing Mass. Parish reception at Healing Mass. 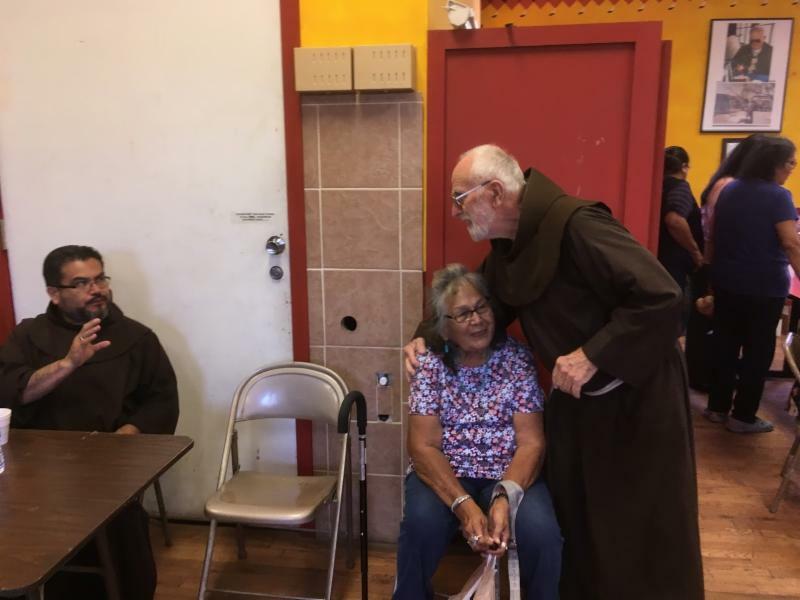 On Sunday, June 24, 2018, the San Carlos Apache Catholic Community bid farewell to the Franciscan Friars, who are turning the care of this mission parish to the Diocese of Tucson. 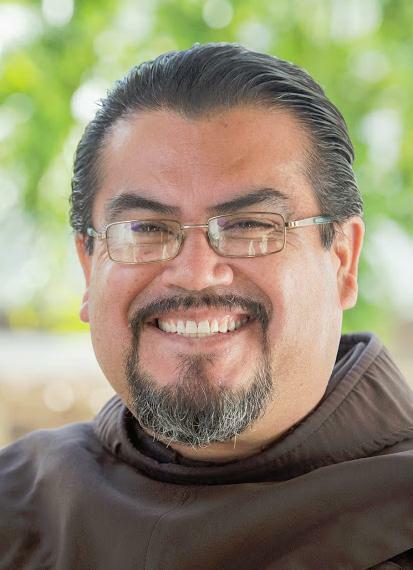 The diocese will be sending a priest to live and minister at San Carlos, but he will be an associate of the pastor of Holy Angels Church in Globe. 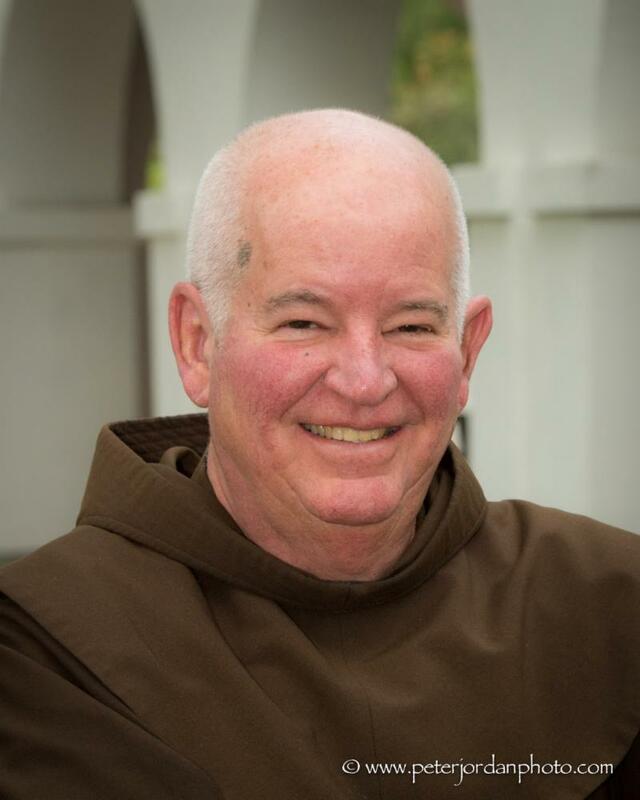 According to Friar Ignatius DeGroot, the outgoing pastor, the friars have been in San Carlos since 1918. This long history with the San Carlos Apaches makes the decision to leave this place a very difficult one. At the end of Mass, Provincial David Gaa shared with the assembly how he was deeply moved the evening before whe he, along with Ignatius and Vicar Provincial Martin Ibarra, went to visit Friar Bartholomew Walsh’s grave in the cemetery close to the church. Bart, who was pastor there for many years, was given an honorary membership to the San Carlos Apache tribe and therefore had the right to be buried in this cemetery. In his homily, Ignatius asked the parishioners to keep the love relationship that they have for one another. 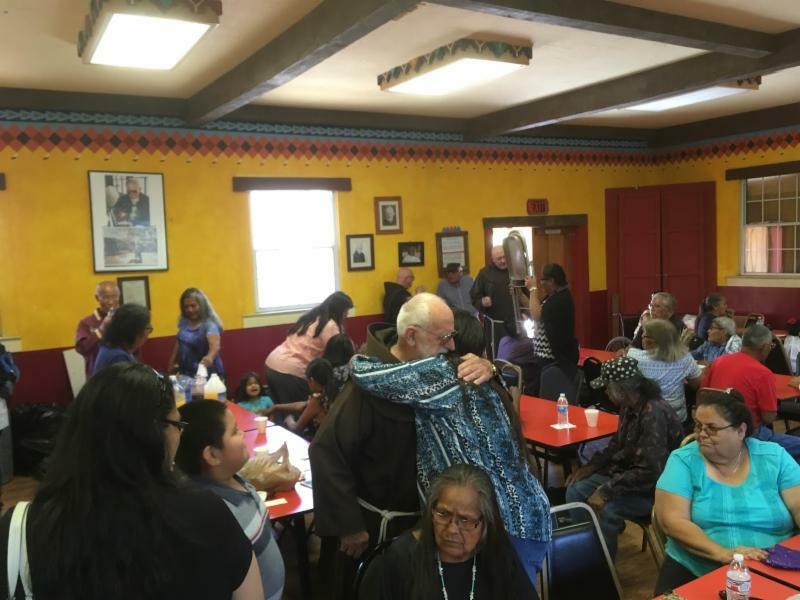 He reminded them that God has always been with the Apache people, even before the Franciscans arrived, and will continue to be with them after the friars leave. At the end of Mass, Ignatius invited people to write to or visit him at his new place: St. Elizabeth Friary in Oakland. Also in attendance were other friars who live in Arizona: Friars Bob Brady, Scott Slattum, Phillip Polk, Sam Nasada, Luis Runde (SHP), and soon to be novice Andrew Dinegar. 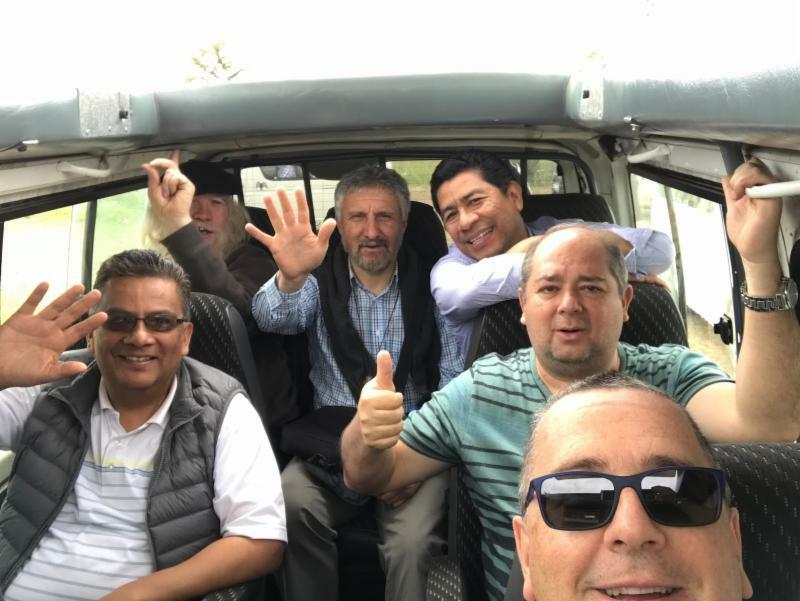 Friars (l to r): Phillip Polk, Minister Provincial David Gaa, Vicar Provincial Martín Ibarra, Andrew Dinegar (postulant) , Ignatius DeGroot, Luis Runde (SHP), and Bob Brady. Friar Ignatius DeGroot, outgoing pastor, with San Carlos parishioners. Video statement by Provincial Minister David Gaa. Please click here to view Provincial Minister David Gaa's video statement. The US government's zero-tolerance policy and the separation of families on our southern border have caused pain in all our hearts. Our work here in Elfrida has not been affected much by this, but I would like to share a valuable information from our friend and collaborator, Sister Judy Bourg, SSND. Sister Judy worked with Southwest Key in the past and she holds this organization in high regard. There has been much conflation of information in the media about Southwest Key. Yes, they do hold migrant children at their facilities, but they were first designed as a response to the surge of unaccompanied (not with their parents) minors from Central America a few years ago. These were mostly teenagers. Southwest Key is a not-for-profit organization and they treated these children with respect and care. The recent zero-tolerance policy, however, has caused Custom and Border Protection (CBP) to send younger children to those facilities, which are not prepared to treat that particular age group. This is the actual problem. Sr. Judy suggested that the pressure is directed not at organizations like Southwest Key, but our immigration law enforcement agencies. 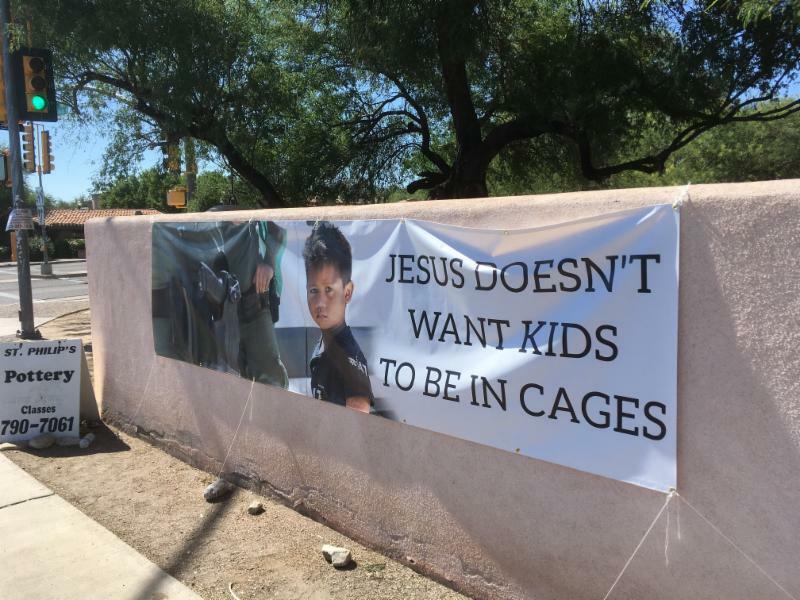 The pictures and videos of kids in cages that were distributed widely recently were not from a Southwest Key facility. They were mostly from a processing center for detained migrants that is run by CBP in McAllen, Texas. 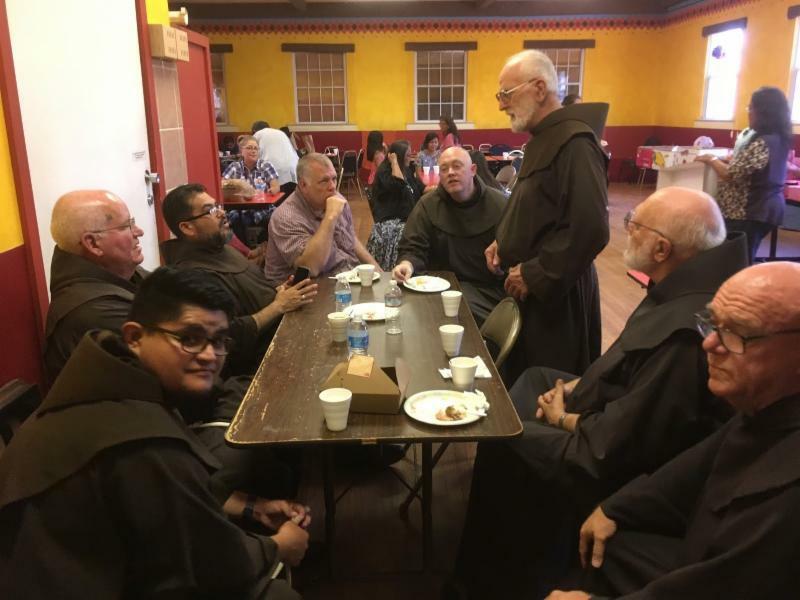 The friars from Assumption (ABVM) Province have had a presence in McAllen for year and have been very active in helping the migrant population there. In fact, one of our confreres there, Friar Tom Luczak, said that their church is only 3 blocks away from this facility. If you would like to help or urge your friends or parishioners to help, I suggest donating to the Florence Project ( https://firrp.org). They are a group of immigration lawyers that provide free legal help to detained migrants in Arizona, especially in Eloy and Florence detention centers. I volunteer at Eloy sometimes, just to visit with some of the migrants there. I know Florence Project has been overwhelmed by the influx of migrants who go to detention and have been charged by the government. I know one migrant who has a serious medical condition but has not been able to get proper treatment. His lawyer, from the Florence Project, is overwhelmed with other cases and has not had much time to fight for his case. 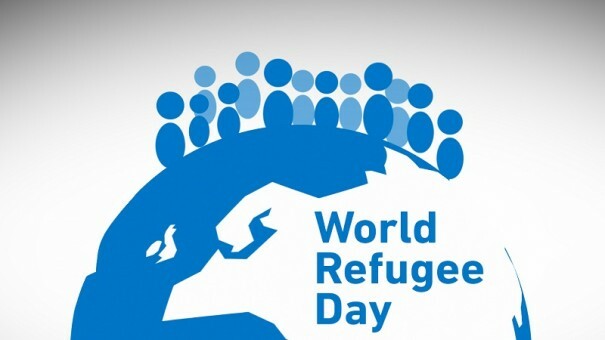 Donating to this organization would help them hire more staff to represent more migrants. Prayer service inside the church. Banner hung on the perimeter wall of the church, facing the streets. The Rev. Robert Hendrickson, rector of the church, gives a welcome message to participants. 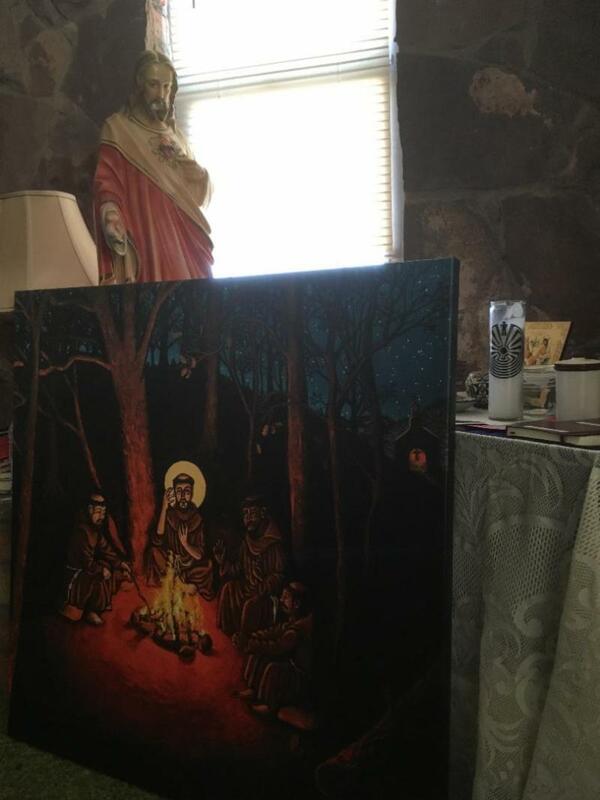 The icon and relics were placed in our living room, with a couple of lit candles, upon its initial arrival. Wednesday, 13 June, we were able to have the icon present, during our 6:30 A.M. Eucharist, with parishioners. Thursday, 14 June, ( Friar Tom Frost had received some difficult news of an infection affecting his remaining heel bone, that same day). Max, Steve and myself brought the icon and prayer service to Tom at the Life Care Center, in Tucson. During the prayer service, when it addressed the possible darkness about the Province’s future considerations, we were also able to share together about our own fears as pertained to Tom's difficult news. 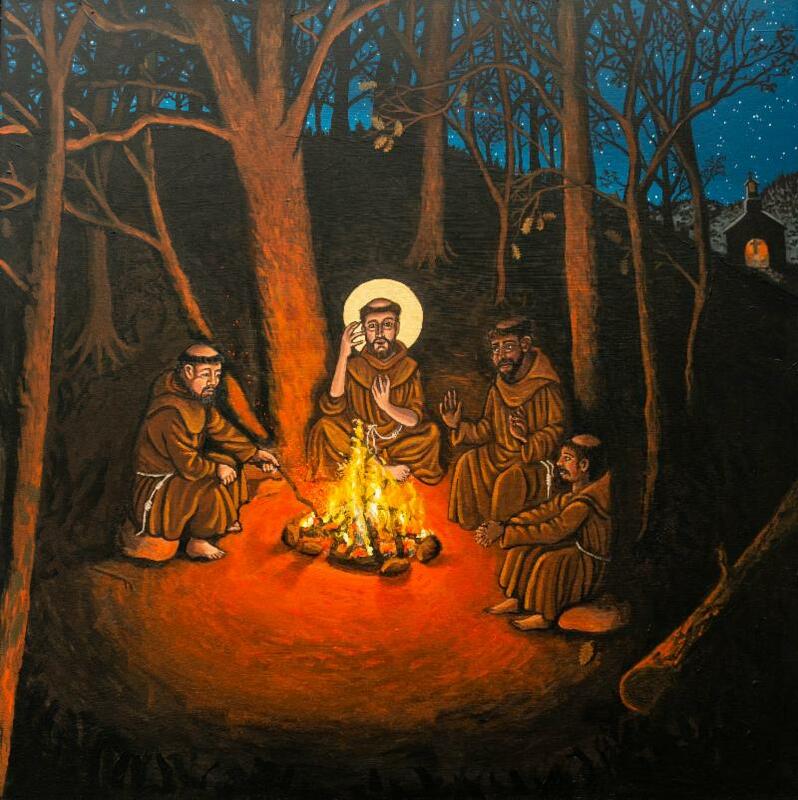 Sunday, 17 June: The icon was brought to Atria del Compaña del Rio, to be viewed during their 10:00 A.M. Sunday Eucharist, and viewed by all of those gathered that included our four friars in residence: Friars Peter Verheggen, Leo Spriestma, Elias Galvez, and José Zermeño. Monday, 18 June: the icon and relics were packed up and prepared for pick up, for its route to the Ite Nuntiate friary in Elfrida, Arizona. 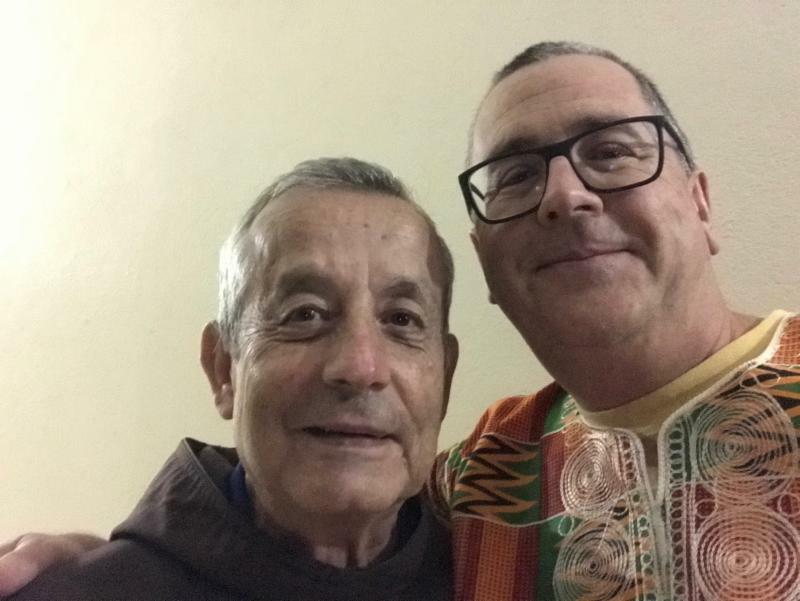 Our brother, Friar Clifford Herle was most moved by the visit of the icon and relics. Friar Manuel Viera (SJBP) took a photo of the icon and we will provide Clifford with a framed copy of it for his 70th Anniversary as a friar, as our community will celebrate on Monday, 9 July. Peace and all good! (and very grateful for the visit of the icon and relics!). For morning prayer, we usually go to the church. We normally have Angie Valdez, a faithful parishioner and caretaker of the church, pray with us. Although David Buer couldn't be with us, we had postulant Andrew Dinegar staying with us for three weeks before he moves on to novitiate. Also, we had a visit from our pastor, Fr. Tom, who’s going back to India and the next pastor, Fr. Mohana, who will take over in July. I invited them to write on the prayer journal and also to share their reflections. Although some of our confreres had concern and fear for the consolidation of our provinces, I have a much more optimistic view. Given an element of grief, at the eventual disappearance of our individual provinces, there is also an excitement about the new possibilities. . . .It is my hope that some more new (interprovincial) communities will soon be formed to respond the "the signs of the time." There is a feel of warmth and openness, joy and peace coming from Francis and the brothers. It’s what I feel from the friars from the 6 provinces who have decided to join together. The theme of fire kept coming back to me. I finally got to watch the video of Episcopal Bishop Curry’s sermon at the royal wedding. Quoting de Chardin, he talked about how humanity had its first big turning point when we were able to use fire as energy for different things to advance our civilization. And if only we could do the same thing with love, then we would definitely create a new earth, the kingdom of God here. 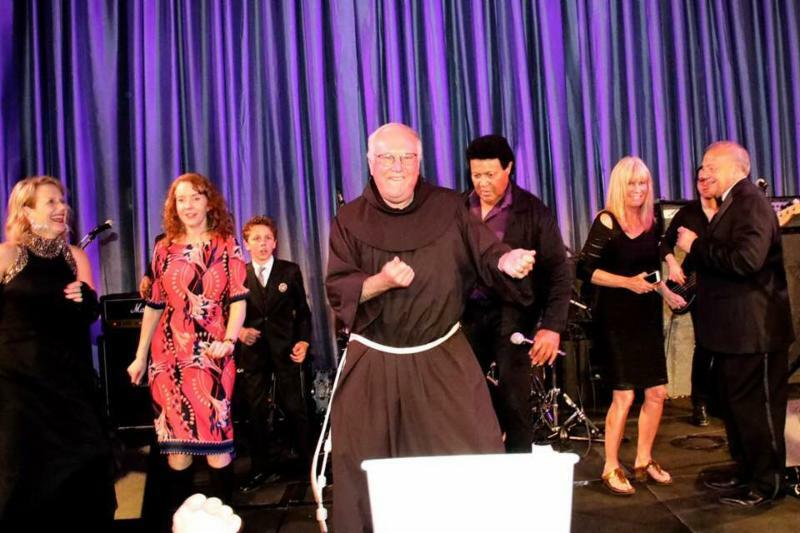 I hope we friars can really harness this love energy and use it to change the world. I like how the friars look different. I think the diversity of cultures of the 6 provinces will enhance and grow our existing provincial culture. Icon in place at Ite Nuntiate fraternity. Greetings from Nairobi, where the Plenary Council of the Order has just concluded after some 2.5 weeks, with considerable success because it provided practical guidance to the Minister General for setting his agenda for the next few years. I knew little of these councils until I actually arrived. These were an innovation within the Order, created after Vatican II to help the Order navigate changes in Church and society, and take place in between General Chapters. They function somewhat like a Chapter of Mats, but with the primary purpose of providing counsel to the Minister General and his administration. Apparently, the last Council was rather acrimonious and unfruitful. 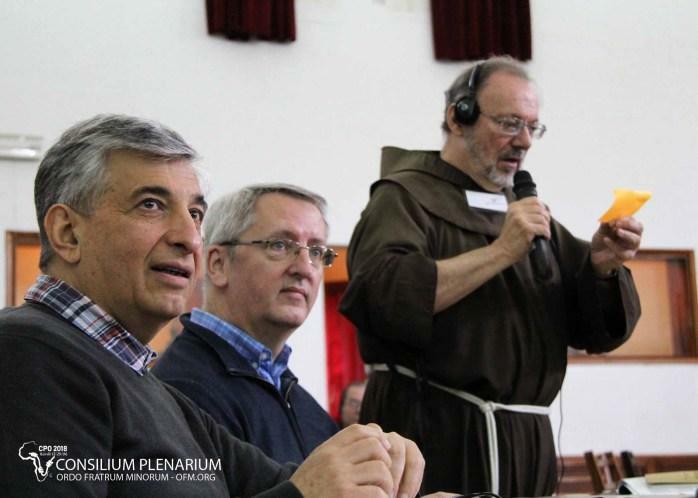 Minister General Michael Perry and the General Definitorium initiated a completely different approach to this Council, using a “synodal process,” akin to that deployed by Pope Francis, a process that is consultative and deliberative, but not decisional. 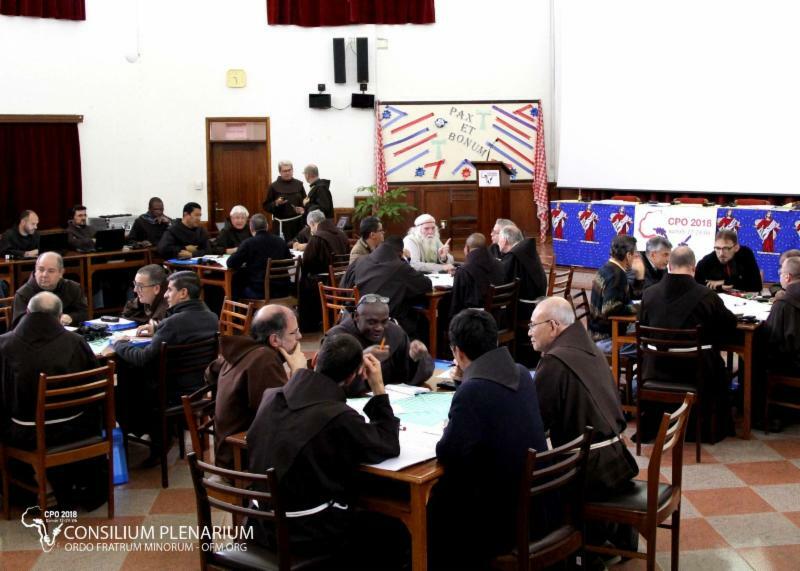 Every conference of the Order was asked to submit a report on the changes in society and Church, and the Friars’ responses. We received the written reports prior to arrival, and then for the first days, each conference presented highlights. From those reports, we identified seven recurring themes. During the second week, we then discussed those themes in small rotating groups through a process known as World Cafe. http://www.theworldcafe.com/key-concepts-resources/world-cafe-method/ This was an enjoyable process, and everyone was pleased at how the small groups were able to overcome language barriers. FOR THE REST OF THE TEXT, CLICK HERE . MP Isauro Covili (Chile), center, rear. For the full text of Minister General Michael Perry's final remarks, CLICK HERE. 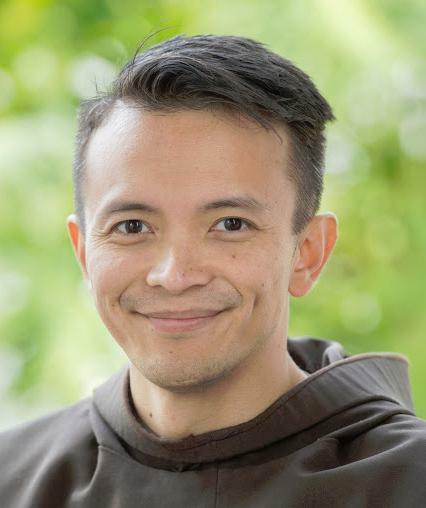 According to communications director Friar Alvin Te, the sessions included participation by 63 friars (including 18 support staff), representing 48 separate entities in 31 countries. The intense and multi-faceted activities of the fortnight worked to put into concrete form the hopes and ambitions of this project. The World Café, for example, served as a structured conversational process for sharing in which groups of people discussed a given topic at several tables for a brief, 20-minute period of time. 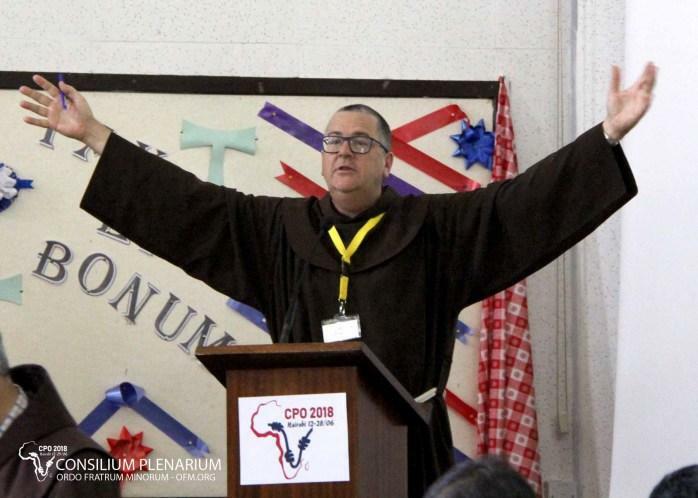 St. Barbara Province was well represented by our brother, Friar Keith Warner, who served as one of the moderators for proceedings. Minister Provincial Jack Clark Robinson of OLG province was present as well (video clip: https://www.youtube.com/watch?v=JgZM7c6Rmpk ). 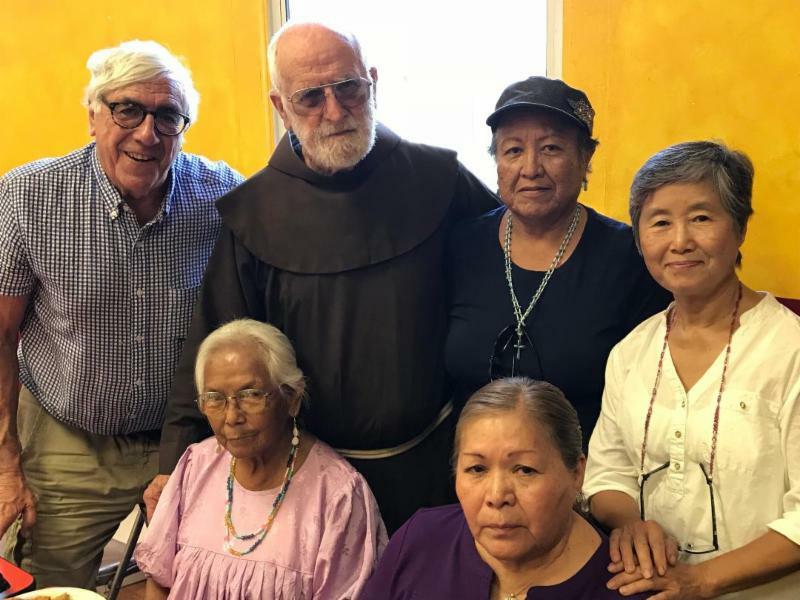 Friar Francis Lee of Korea (video: https://www.youtube.com/watch?v=0H8QD_kP7m8) but well-known to friars of our Province, also served as an articulate spokesmen during the Conference. Creative interchange was fostered by small group work and plenary discussions, focusing on the most important issues raised in the Council Members’ presentations. From a process of sharing and discussion, ideas were refined until a synthesis emerged that in turn would lead to directions and guidelines from the PCO. This material will then form the basis for a final document to be sent to the Order by the Minister General and Definitory. 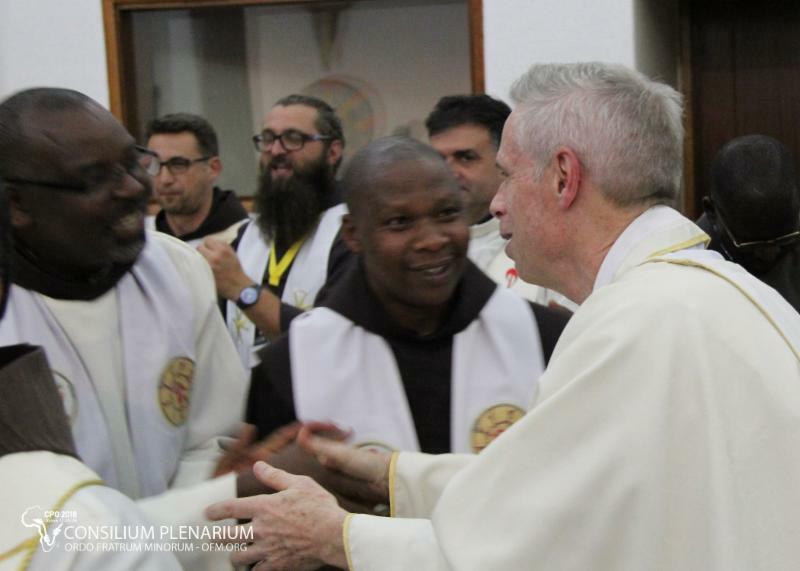 Photos: All photos courtesy OFM Curia. 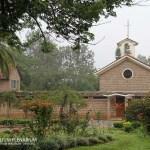 PCO site, Dimesse House of Spirituality, Nairobi, Kenya. Friar Keith Warner (2nd left) next to Minister General Michael Perry. PM Jack Clark Robinson (OLG) addresses the meeting. The World Cafe is a structured conversational process for thought sharing in which groups of people discuss a topic at several tables. Individuals switch tables periodically and are then introduced to the previous discussion at their new table by a “table host”. Each table conversation lasts for 20 minutes and is conducted in an informal and inclusive fashion. The table hosts gather the opinions of the friars and write these on a large tablecloth (paper!) and then present this collection of thoughts, comments, and opinions to the next group. The participants in their turn are “ambassadors of ideas’, bringing the product of their previous group conversations to the table. 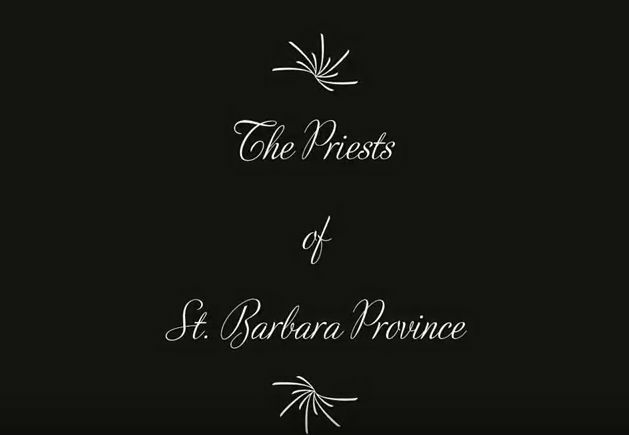 The leadership of the St. Barbara Province recently announced its endorsement of the Catholic Climate Declaration. The Declaration announces support for the Paris Climate Agreement and affirms our shared commitment in prayer, word and deed to meet its goals for the sake of the one human family and Our Common Home. To date, nearly 600 institutions, including some 40 archdioceses and dioceses, have signed the Declaration. The leaders also shared the remarkable faith-based actions they are taking in charity and justice to address climate change. The nationwide petition drive will culminate in a September 12-14 Global Climate Action Summit to be held in San Francisco. Mr. Otto E. Buer, father of Brother David Buer, died on Tuesday June 26, 2018. He was 88 years old and at home surrounded by his family. A Celebration of Life service was held on June 29, with burial on Saturday June 30, 2018 at Calvary Cemetery in Edwardsville, Illinois. The recent Sunday readings speak about mustard seed and the fruits which come about from the plant that grows from the seed. 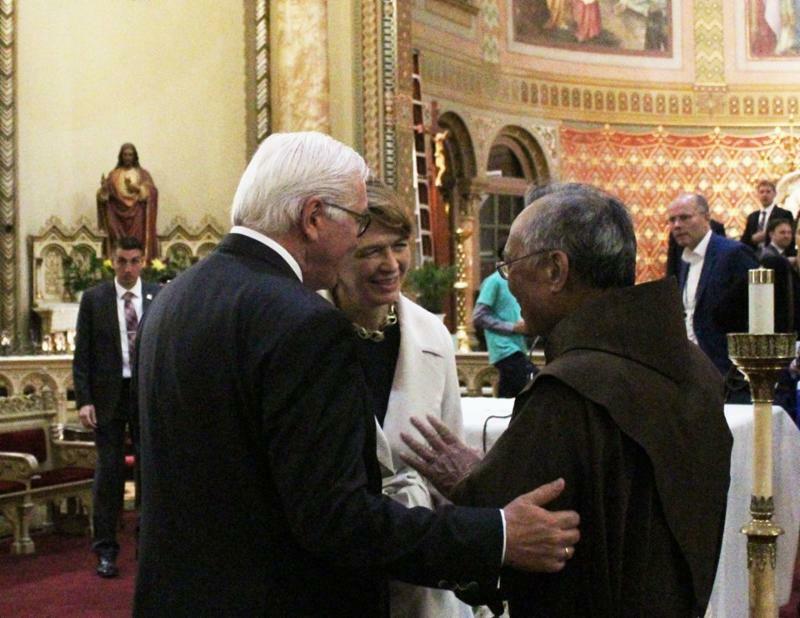 It was a beautiful way to share with the President Frank-Walter Steinmeier and his wife Elke about how the beautiful Gubbio Project and St Anthony Foundation are but only a few of the wonderful fruits arising from the seeds of faith planted by the early German immigrants to San Francisco in the 1860's resulting in the founding of St Boniface Church as the German national church. 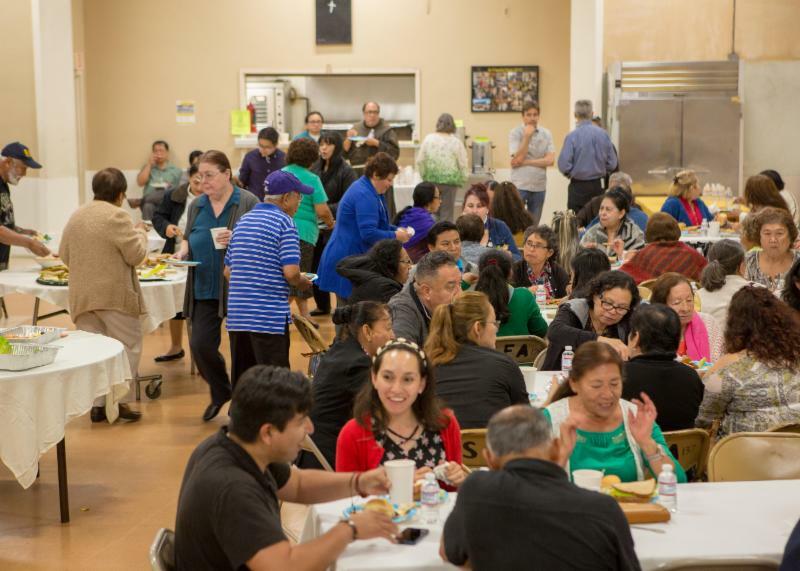 Though our status as a national church ended in the 1960's when we became a general parish, the parish applied its many lessons of working with immigrant and refugee groups to result in the parish of 5 cultures that we have today, e.g. Filipino, Hispanic, Vietnamese, African American Gospel, and retired. And more importantly, in these past 14 yrs how we found the courage to make the leap of faith to minister to the homeless through the Gubbio Project. The tree of faith which grew from the seeds sown by the German immigrants in the 1860's has yielded a bountiful harvest in the eyes of God ! The teacher in me merged with the preacher in me as I spoke with these guests. The president is an evangelical Protestant and his wife is Catholic! So the parable of the mustard seed was perfect for the moment! After serving as gift shop manager here at San Xavier del Bac for 29 years, Judy Parker has been incorporated into the Province. 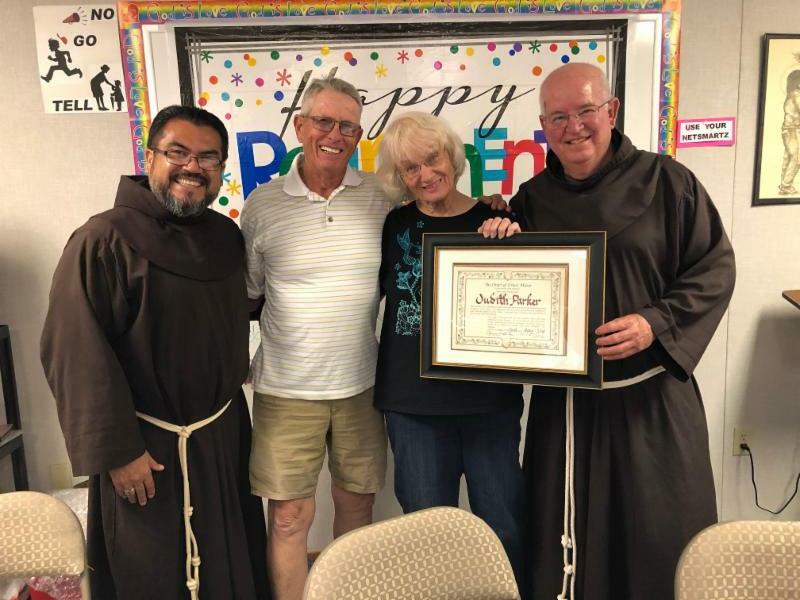 Judy is shown here (photo) with her husband John along with Minister Provincial David Gaa and Vicar Provincal Martín Ibarra at the festivities held at Mission San Xavier del Bac, Tucson, AZ on June 26. We thank God as we celebrate Judy’s many years of her sharing her service, talent and skill shared in so very many ways!! Photo: courtesy, M Ibarra OFM. 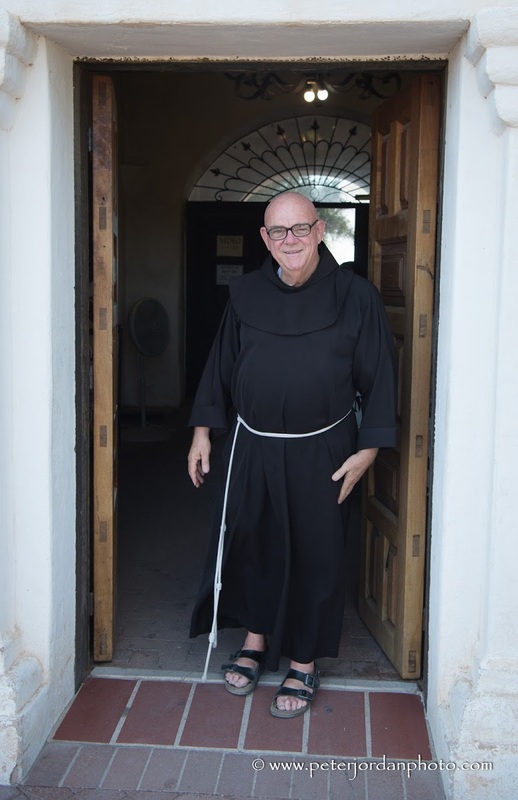 Friar Mark McPherson, who just transferred to our province this year, is in Jerusalem at the moment (June 15) fetching his belongings to move to our province. I asked him to say hello to Brother Leo Gonzalez for all of us and asked him to take a picture of him to put into OFM/FYI. 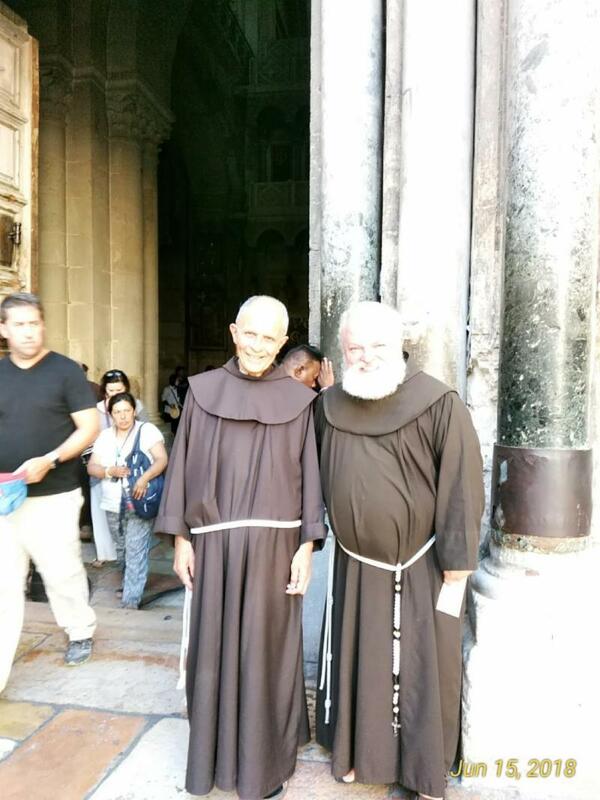 Friars Leo Gonzalez (l) and Mark McPherson (r ) in the Holy Land. Our brother Larry Gosselin’s recent dance session with Chubby Checkers (originator of “The Twist”) was just the lead up to festivities surrounding Larry’s 70th birthday. If this is what 70 is like, we can’t wait to see what Larry’s 71st birthday will be.